Move oven rack to lowest position (remove other racks). Preheat oven to 350°F. Bake 37 to 47 minutes or until top is dark golden brown and cracks feel very dry and not sticky. Do not underbake. Immediately turn pan upside down onto glass bottle until cake is completely cool, about 1 hour. Run knife around edges; remove from pan. Crush or finely chop candy bars; reserve 1/3 cup. Fold remaining crushed candy into whipped topping. Tear cake into about 1-inch pieces. Mix cake pieces and whipped topping mixture. Press lightly in ungreased 13x9x2-inch rectangular pan. Sprinkle with reserved crushed candy. Freeze dessert about 1 1/2 hours or until firm. Cut into squares or spoon into dessert dishes. Freeze any remaining dessert. In a hurry? Just buy chocolate-covered toffee bits. 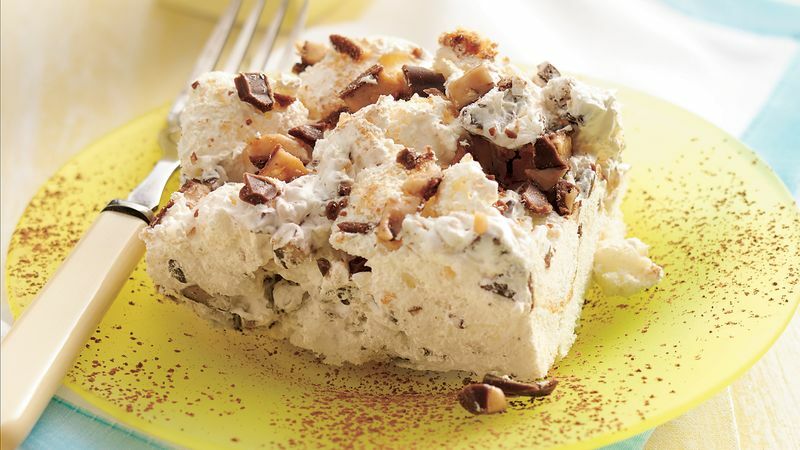 Get cracking on this cake--freeze the candy bars for easier crushing or chopping.